So this week has been interesting.. discovering that “whiplash”, a word I have heard since I was a kid, is quite under rated. I got to work on Monday, was doing the usual tasks I do on a usual Monday in usual Sydney, Australia. Then by about 10am.. I felt my neck was quite sore and tight, as was my back. I told a few people at work and they said “oh no, you need to see someone, cause whiplash can take a while to appear”…. so what do I do? I look up “chiropractor” online and find one round the block from me. How convenient. Whether the chirpractor was what I needed, I didnt know, I was walking blind. I arrived at the chiro, a few hours later. First thing I noticed, it took a rediculous ammount of effort to open the door. You would think.. that at a CHIROPRACTOR that the door would be easy to open. I greeted the receptionist, filled out paperwork then sat down on the lounge. Why was the lounge, facing the bin? And the giant flatscreen Tv on the wall was to the right. So everyone with sore necks and backs had to turn their necks on the lounge to see it. HM. So I meet the chiro and walk into the room. He asks me to dress down, into a gown. Ah.. ok? He leaves and I then forgot to ask him whether he means underwear too, or not? I decide to just go the whole hog and be naked under the gown. 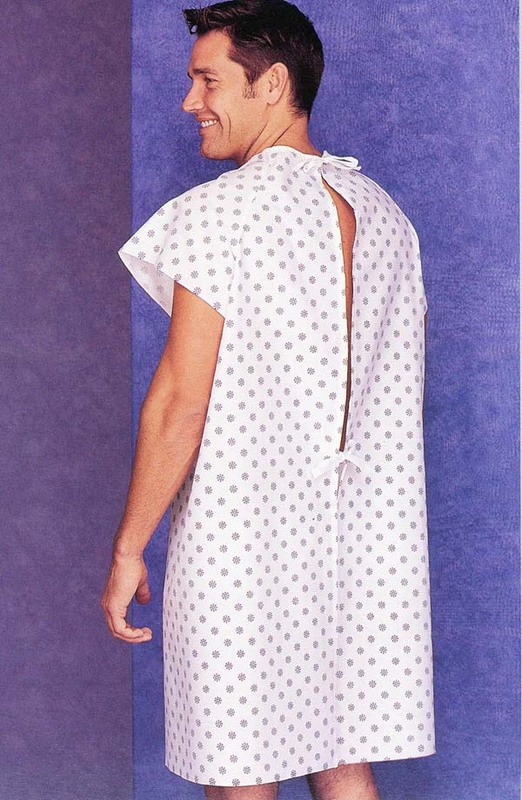 This is not me, just a model showing he enjoys the gown. Though I think everyone looks awkward in them. He comes back in and looks at my neck then decides to give me x-rays. So after holding a broom up in a dark x ray room, I am then allowed back to the consultation room, trying to make sure my gown doesnt open up the back.. By this time he has noticed I didnt have underwear on, but makes no comment. He gets a massage therapist called Trent to come in, discuss with me about his weekend of concreting, while he massages my back. He is quite hot and likes boat sheds. The chiro comes back, tells me to fall back into his arms, whatever for? Well as I discover, to crack my back when I wasnt aware this was to happen. I hate it when people crack their knuckles, so this was just, disturbing to hear that crack come from my back. He arranges another visit with me for the following day, I pay the woman called Jo at reception then leave. I feel a tad worse after and go home from work. The second visit the next day I changed down JUST to my underwear, after I was embarrassed to discover I didnt need to be totally naked. After another massage from another guy, not Trent, and who didnt talk, and another back crack, it was over. I decided not to go again. So today, being Thursday, decided to sit at home and just rest my back. Whoever thought it would be this much effort for whiplash? I have heard too many horror stories about whiplash to not take it seriously right now. And my chicken is laying again. She went through menopause and didnt lay for 2 years, and now she is again. Menopause just didnt suit her, good old Denise. I got to chat to my good buddy Phil on skype earlier, and catch up with his news. He moved to USA a few months ago to persue the man he loved, which is beautiful and they are really happy. So that has made my day hearing about how well it is going. Plus I got to eat cocoa bombs this morning, my sister wont ever know I nicked them. Well, she will, the box is now empty. Previous Post It WAS going to be a quiet Sunday..